Archdiocesan Pastoral Institute was founded by the Archbishop of Zagreb, Cardinal Josip Bozanić on October 3, 2007, on the ninth anniversary of the beatification of Cardinal Aloysius Stepinac, and it was opened on November 6 of the same year. It was envisioned as a new meeting place of the Church of Zagreb and as an instrument of synodic renewal of our archdiocese. 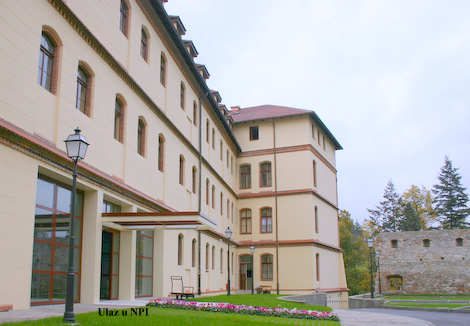 The Institute is a teaching and educational, and if necessary, research institution of the Zagreb Archdiocese. The Institute has four halls and seventeen guestrooms: Vijenac Hall with a total of 300 seats (210 stalls and gallery 90 seats). Hall I, on the ground floor of the Institute, is a multipurpose hall with a maximum capacity of 130 seats. Hall II is on the first floor of the Institute with amphitheatre seating style and 110 seats. The hall is audio-visually connected to Vijenac Hall. Hall III, on the first floor of the Institute, can hold meetings for groups of up to 20 participants. Space for guest accommodation is located on the second floor of the Institute, and 15 double rooms and two single rooms receive a total of 32 guests. All rooms are equipped with the latest digital technology for all types of presentations and other events, and all the halls and rooms have Wi-Fi access. dialogue with the modern world.